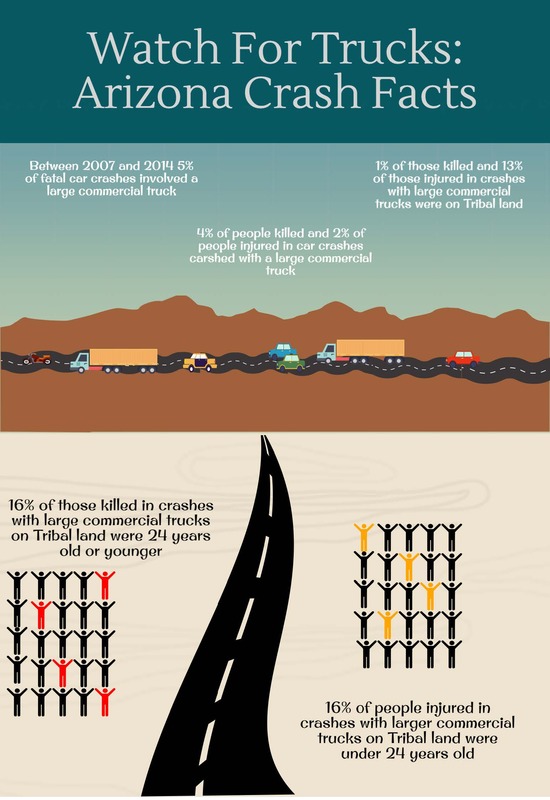 The elimination of all unintentional motor vehicle crash injuries and fatalities among American Indians, on and off tribal lands, by addressing environmental, behavioral, and political factors that influence these events. To assist Tribes within the Phoenix and Tucson Indian Health Service Areas with building injury prevention program capacity by supporting the development of, or improvements to, infrastructure in surveillance, prevention, and evaluation information, for planning and motor vehicle crash and injury prevention policy decision making. 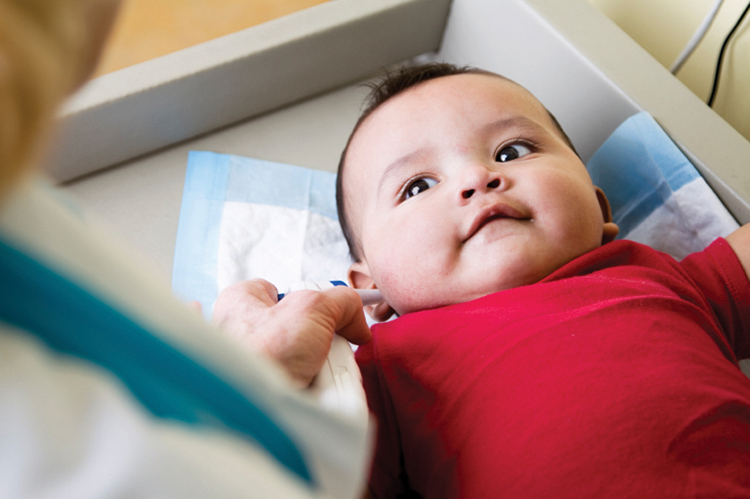 To build Tribally-driven motor vehicle crash injury prevention capacity within the Phoenix and Tucson Indian Health Service Areas, in order to improve American Indian health and well-being. 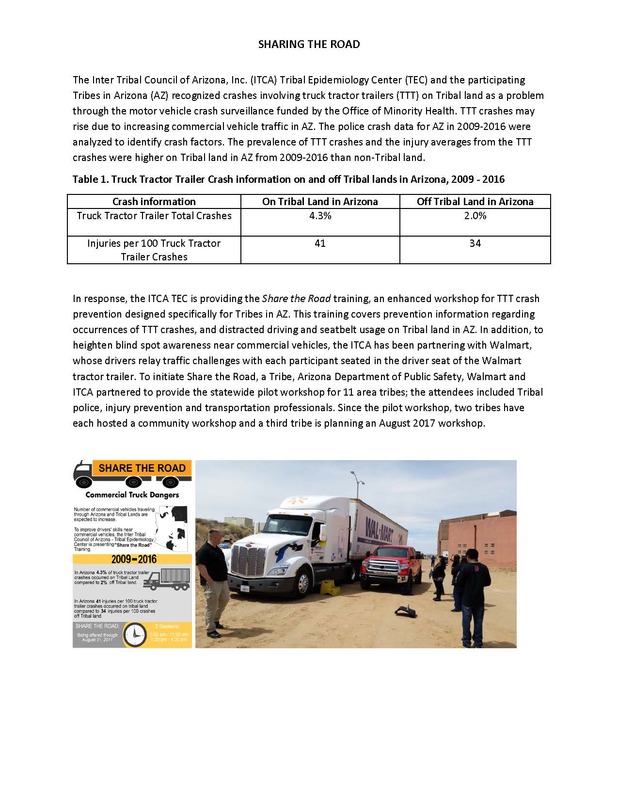 The Tribal Epidemiology Center and the ITCA Transportation Program work cooperatively to provide Tribes with technical assistance to address motor vehicle crashes. Additional related materials are posted within the ITCA Transportation Program reports and publications page. • TBI awareness: Increase available information on brain injury prevention through School of Hard Knocks training. 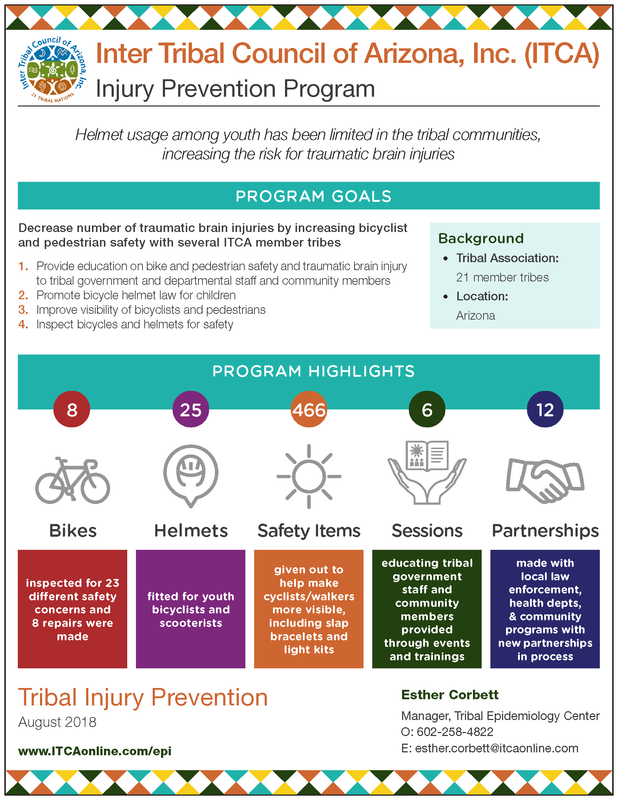 o TBI injury death age-adjusted rates were highest among American Indians/Alaska Natives (34.8 deaths per 100,000 residents). o TBI inpatient hospitalizations (IP) were the highest among American Indians/Alaska Natives (258.3 IP per 100,000 residents). o Four percent of all serious injuries. o Enhance training programs for all roadway users and safety practitioners. Be Safe, Be Seen explains the importance of visibility of bicyclists and pedestrians during night-time. The best practices are: 1) wear reflective clothing and 2) use safety equipment, like bike helmets, and bike lights and reflectors. 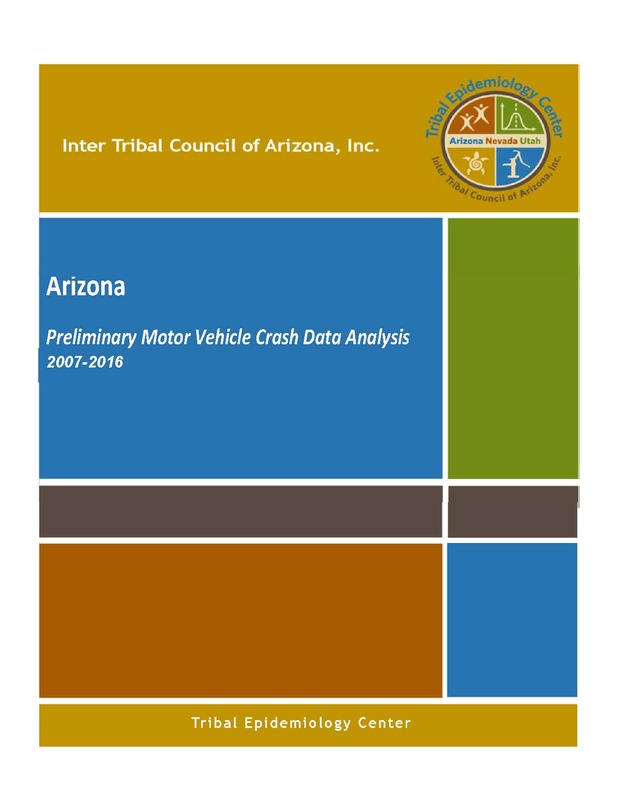 Arizona Preliminary Motor Vehicle Crash Data Analysis Report, 2007-2016: This study analyzed data to compare crashes involving fatal and incapacitating injuries on-tribal land and off-tribal land. The six selected crash characteristics were: restraint usage, young drivers, speeding, impaired driving, lane departure and intersection involvement. The data were available from the Arizona Accident Location Identification Surveillance System. 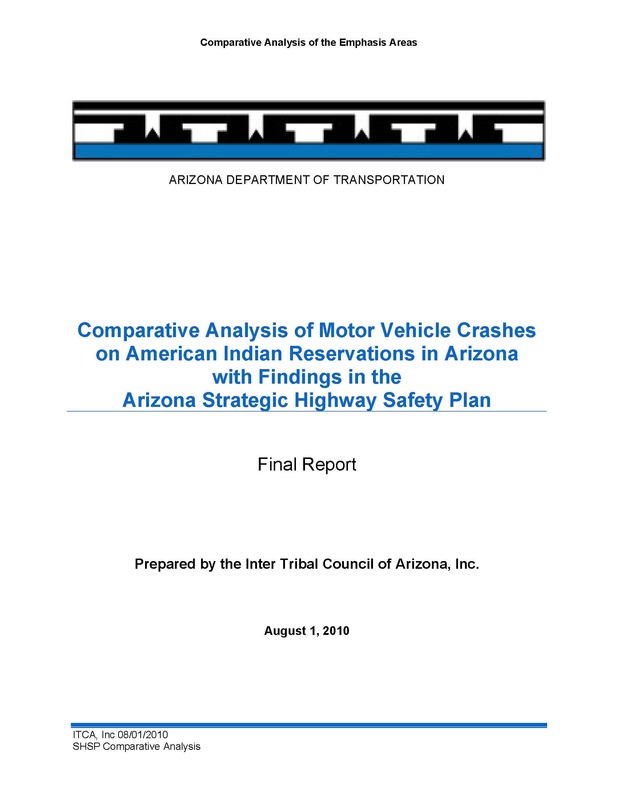 Comparative Analysis of Motor Vehicle Crashes on American Indian Reservations in Arizona with Findings in the Arizona Strategic Highway Safety Plan: This study analyzed data from 27,382 motor vehicle crashes (MVCs) on tribal lands in Arizona over the period 1997-2006. The data were available from the Arizona Accident location Identification Surveillance System. 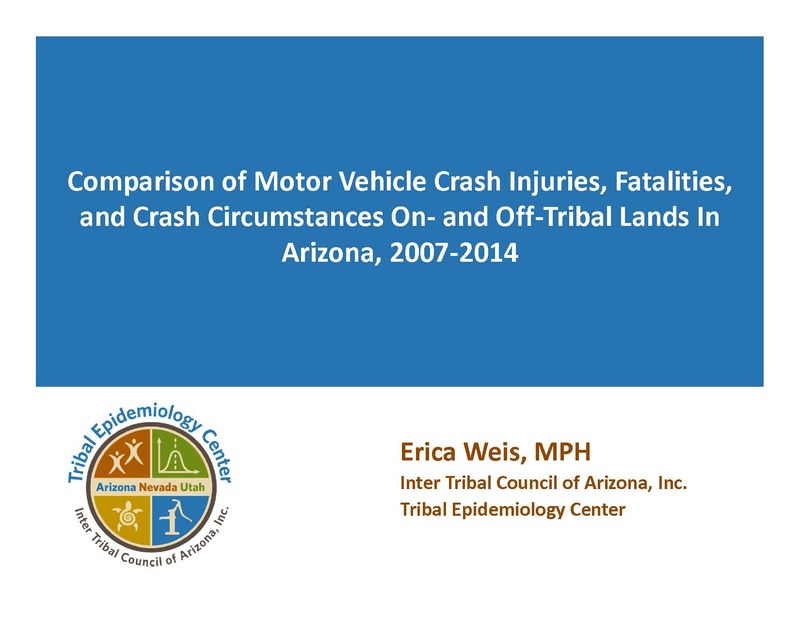 Comparison of Motor Vehicle Crash Injuries, Fatalities, and Crash Circumstances On and Off-Tribal Lands in Arizona, 2007-2014: This presentation is a summary of the initial analysis that compared 2007-2014 crashes On-Tribal lands with crashes Off-Tribal lands in Arizona. The data source is the Accident Location Identification Surveillance System, which is comprised of crash reports filed by law enforcement. Crashes were designated On-Tribal lands and Off-Tribal lands using geocoding. 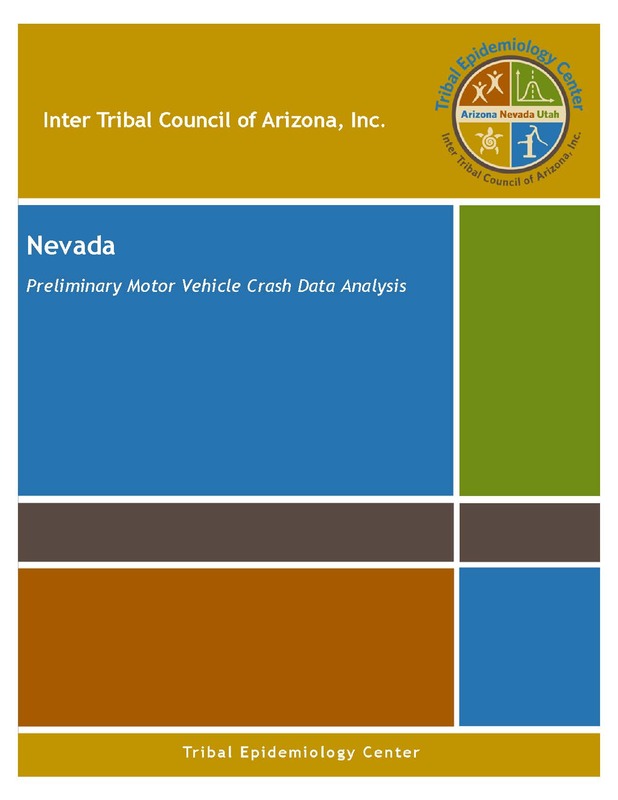 Nevada Preliminary Motor Vehicle Crash Data Analysis: This report examined the factors associated with crashes on Tribal Lands in Nevada during 2007-2014. The data came from the Nevada Department of Transportation and includes information from crash reports filed by law enforcement. Crashes were designated On-Tribal lands using geocoding. 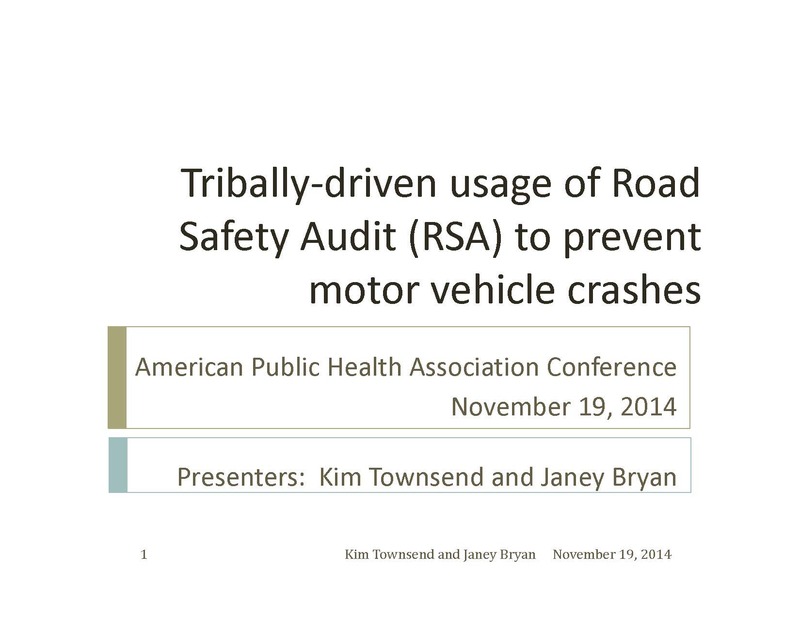 Tribally-Driven Usage of Road Safety Audit (RSA) to Prevent Motor Vehicle Crashes: This presentation provides an overview of the 2013 Road Safety Audit (RSA) performed for the Duckwater Shoshone Tribe in Nevada. A RSA is one of nine proven safety countermeasures endorsed by the Federal Highway Administration of the U.S. Department of Transportation. The Tribe received technical assistance from the Nevada Department of Transportation to assess the safety of roads within and adjacent to their Reservation. To document the hazards, the RSA team took photos and logged issues by road location, and prioritized the recommendations in a RSA report, which is being utilized by a multi?disciplinary coalition to prevent crashes. 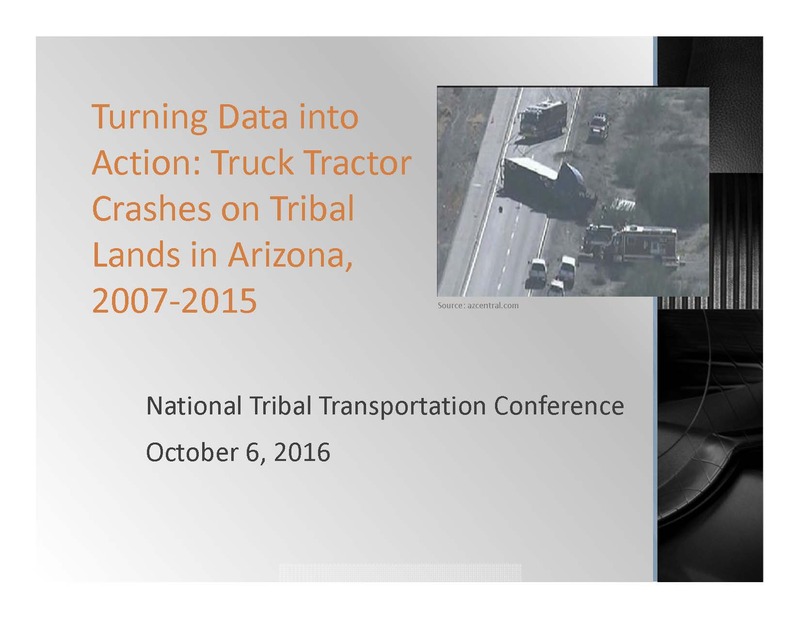 Turning Data into Action: Truck Tractor Crashes on Tribal Lands in Arizona: This presentation is an overview of the 2010 and 2014 Road Safety Assessments and 2016 Share the Road training completed for the Kaibab Band of Paiute Indians in Arizona. The Tribe received technical assistance from two state agencies to address concerns with commercial vehicle traffic that is crossing the reservation on State Route 389. The Arizona Department of Transportation lead two multi-discipline teams to assess three intersections on State Route 389, which is a freight route and an access road to the Grand Canyon. The Arizona Department of Public Safety and Walmart delivered training on driving strategies to use near commercial vehicles. 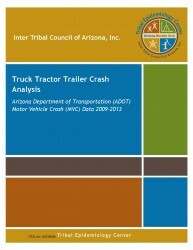 Truck Tractor Trailer Crash Analysis Report: This report examined the impact of truck tractor trailer (TTT) crashes that occurred on Tribal lands in Arizona during 2009-2013. The report describes the burden of injury due to TTT crashes and identifies opportunities for interventions. The data source is the Accident Location Identification Surveillance System that includes crash reports filed by law enforcement with the Arizona Department of Transportation. Crashes were designated On-Tribal lands using geocoding. 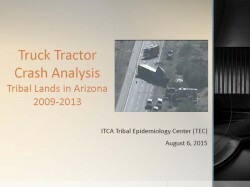 Truck Tractor Crash Analysis: This presentation summarizes the factors of truck tractor crashes on Tribal lands in Arizona during 2009-2013 and linked the topic with the increase of current and future TTT traffic in Arizona. Bike Traffic Skills Training: This presentation covers four Bike Traffic Skills trainings conducted in 2015 for youth ages three to sixteen. 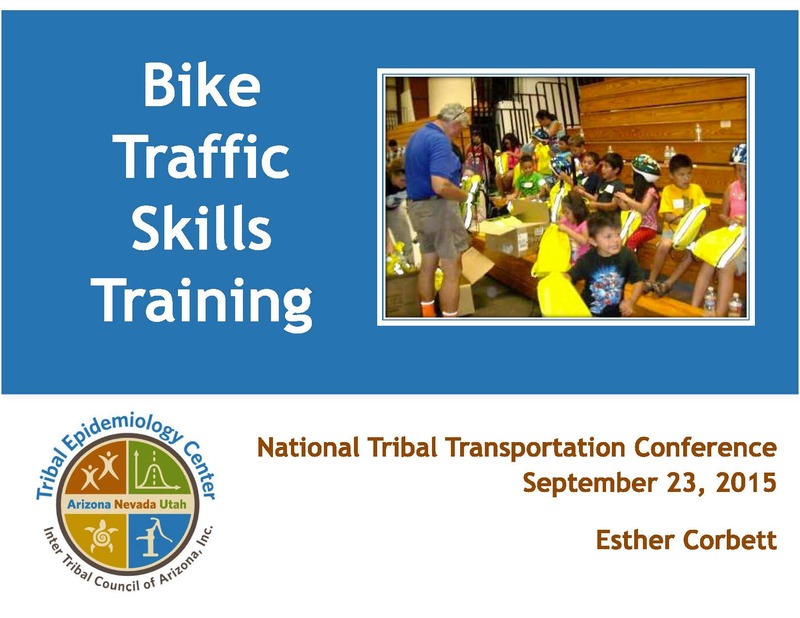 Certified instructors with the League of American Bicyclist assisted the Hualapai Tribe, Kaibab Band of Paiute Indians, Duckwater Shoshone Tribe and TeMoak Tribe of Western Shoshone to deliver the trainings. 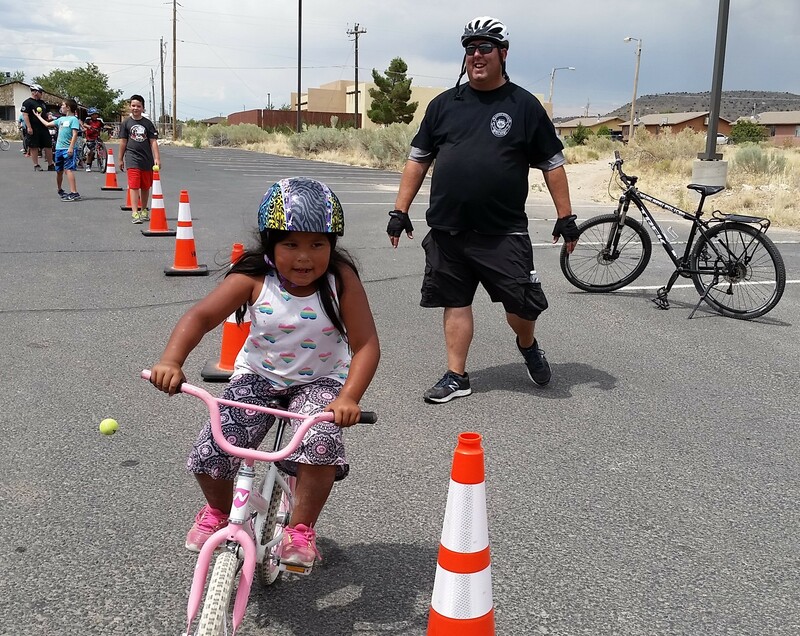 Pooled resources from the Department of Health and Human Services Office of Minority Health, Hualapai Nation Police Department and Nevada Department of Transportation funded bike maintenance, helmets and the courses. 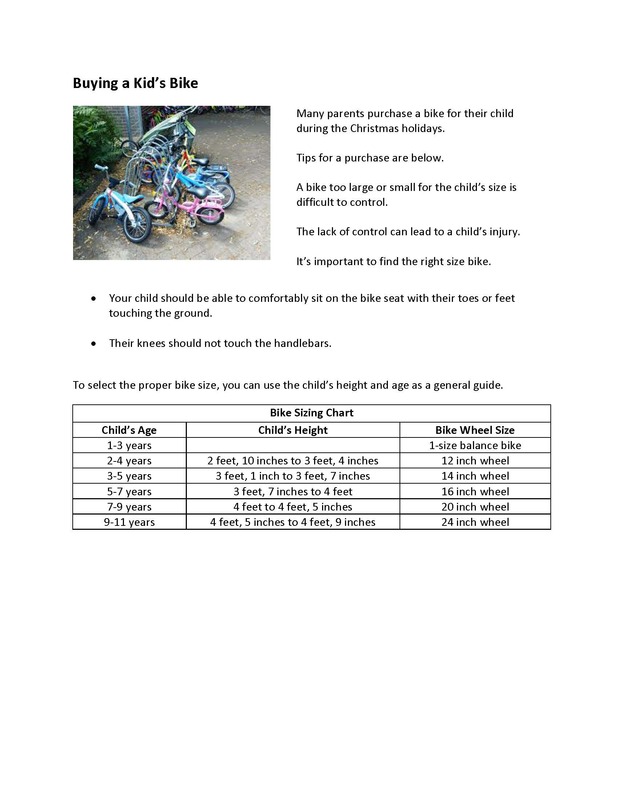 Buying a Bike for Kids: To prevent injury, the child’s height and age need to be considered when purchasing a bike.